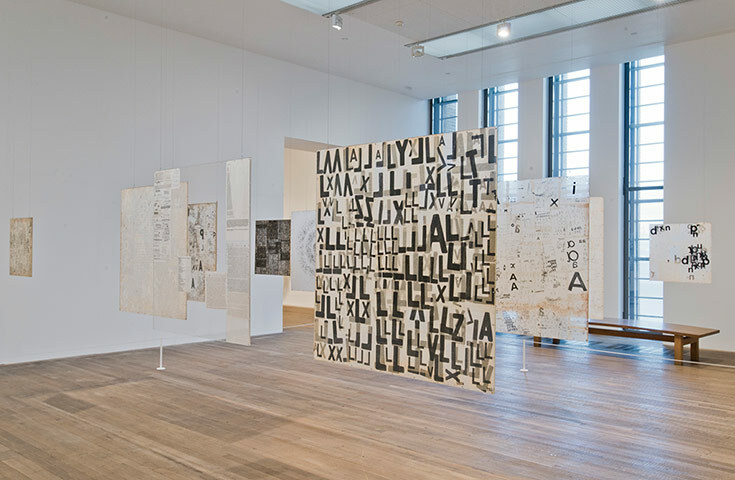 A Jewish wartime refugee, Mira Schendel became one of Brazil’s greatest artists. If you have never heard of Mira Schendel – painter, poet, sculptor and Jewish refugee from fascist Italy – then you are by no means alone. Schendel is extremely famous in Brazil, where she eventually found a foothold, but practically unknown over here. Her work is beautiful, pensive, quirky and so delicate it might fly away in a breath, which is partly its point and possibly one reason we have seen so little of it. Much of the work in this huge retrospective has never travelled outside Latin America. Born in Zurich but brought up a Catholic in Italy, Schendel (1919-88) was studying philosophy in Milan when she was stripped of her citizenship as a Jew. In 1939 she fled Italy as a refugee without documents and seems to have passed through several countries by stealth before arriving in Sarajevo, where she married a Croat and acquired the papers that got them both to Latin America. It would be an overstatement to describe her art as restless, but there is a definite sense in which that passage through Europe registers in her work. The stunning still lifes in the early rooms of this show, for instance, have clear overtones of Paul Klee and Giorgio Morandi: fantastical cityscapes, silent vessels on the tabletop. But Mira, as she tersely signs herself, breaks through at every turn. A gorgeous painting, so simple and yet so rich, shows a spoon, a cup and a couple of jars all arranged like small monuments in a geometric composition the colour of old copper and patinated bronze. She had a way of making the world look ancient and yet vividly modern. Too poor to buy proper paints, Schendel worked with cheap combinations cut with talc and brick dust, so that some of the surfaces are now poignantly friable as old plaster. Pictures were made on the kitchen table (she had no studio), assembled out of collage or painted in wet charcoal, like the brilliant portrait of a water bottle by night, the clear fluid shining in the darkness. When a friend appeared with a stack of rice paper, Schendel found both her medium and – in a sense – her message. Rice paper is there and not quite there, something on which you can paint but almost invisible in itself, a surface so diaphanous it is nearly transparent. Her Bordados (Embroideries) were made by laying rice paper on sheets of glass sprinkled with talc and ink and drawing on the paper with her fingernail. The effect is a Zen-like poetry of tiny marks – symbols, numbers and letters that nearly amount to words but stay just on this side of visual abstraction. The symbols march, swirl or cluster, trailing out into vast spirals or clinging together like busy swarms of bees. They appear on sheets of rice paper that flutter from the ceiling on invisible threads; they appear behind glass – pictures you can almost read; they appear trapped in Perspex like flies in amber. She may never have completed her studies, but Schendel remained a philosopher to the last. Her art has its sources in phenomenology, in the idea of being and nothingness, in mystical thinking and her deep reading of Wittgenstein. But the impact of these works does not depend upon the viewer sharing either that knowledge or those interests. Schendel might isolate a single letter on a see-through sheet because it is on the verge of representing nothing – neither language nor form – but still it will have the strong power to charm. I particularly loved her capital Ls, marching back and forth in all directions like long legs in boots, until they recede into crowds of muffled footsteps in the distance. 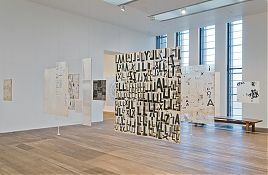 One of the 14 galleries in this show (Schendel was frenetically prolific) looks quite suddenly Brazilian, filled with cool white sculptures that recall the stylish art of Hélio Oiticica, Lygia Pape and the neo-concrete movement. A marvellous line of rice paper sheets, hung up like so much washing, creates a continuous ruff across the gallery that flutters as you move. Clear acrylic strips, tacked together in different permutations, drift from the ceiling, casting an ever-changing frisson of shadows against the wall – being and nothingness, to be sure. But although Schendel became a doyenne of Brazilian art, there is something quite singular about her work. You see it in the beautiful Perspex discs inset with microscopic symbols that act as prisms, throwing bright new images against the wall, twisting and turning on their fragile threads like silver honesty leaves. You see it in the perforation works, where she uses a hole punch to create miniature constellations in dark paper or a dizzying carnival of black discs in white. And you see it above all in the crowning work of this show, made for the 1969 Venice Biennale and now recreated at Tate Modern. The very title – Still Waves of Probability (Old Testament, I Kings 19) – goes to the heart of her characteristic combination of extreme rigour and mystical fancy. A great deluge of nylon threads drops down from the ceiling, splashing on the floor like the waves of an ocean, a girl’s soft curls, or the upward spatter of pouring rain. The vision is perfectly simple and completely mesmerising. One cannot see the threads, precisely, and yet somehow the vision appears – the visibility of the invisible.